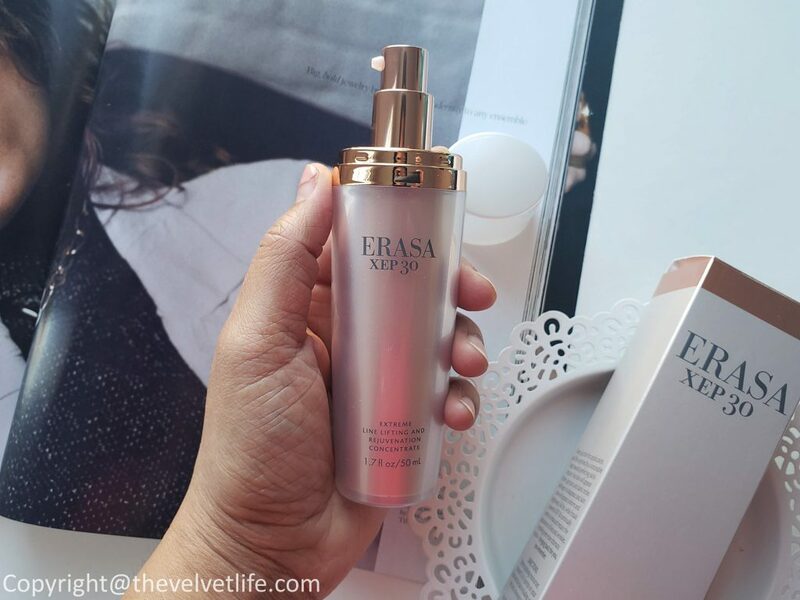 Like me, you should be thinking of why, when, and how about this brand and the hero product – Erasa XEP 30 I mentioned in the title of this post. 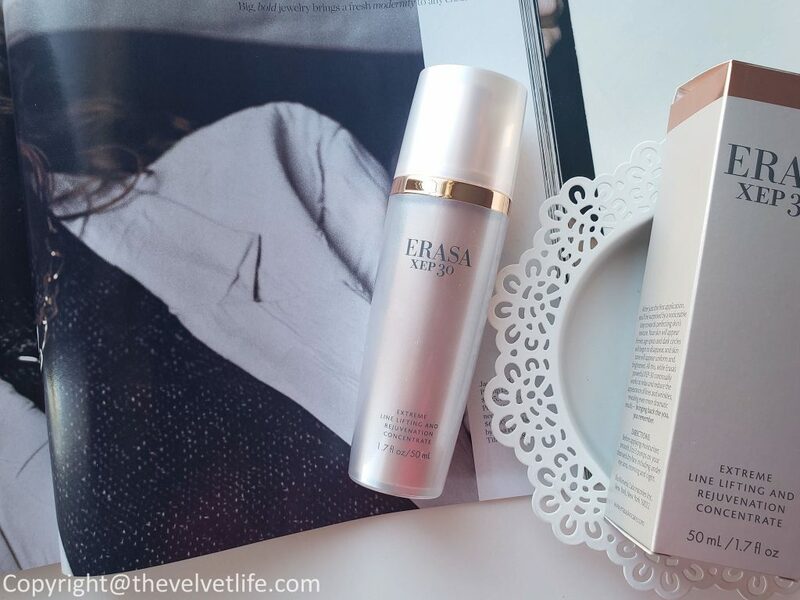 Erasa is a new and luxurious skin care concentrate which is clinically proven to help erase not some but all visible signs of aging including the smoothing of deep frown and expression lines and crow’s feet previously only available by injection. This is all the official definition and everything sounds so intriguing. 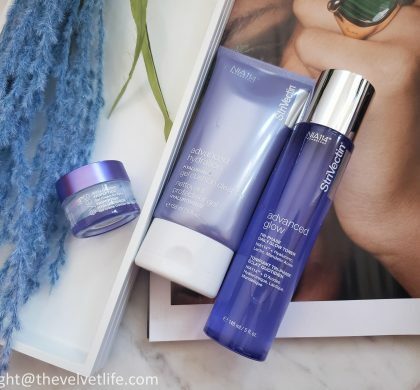 I am in my mid-30s and with consistent skincare routine and care, I do believe that it is going to be beneficial for the long run. One one side, I am concerned about skin aging and wrinkles, but on the other side I am still struggling with acne and dark spots. I was double minded before starting to use this serum as usually the anti-aging products are too rich for my combination skin. From the first use, I could notice the difference in my skin texture. Using this for few weeks on and off, I am quite liking it in my skincare routine. I have noticed an improvement on my pore size, the quality and texture of the skin, skin looks more even, firm, and clear. The serum is hydrating and still does not cause any breakouts. I use it on my clean skin day and night, 2-3 pumps of the serum are good to cover the face, neck, and decollete. The serum quickly absorbs into the skin. 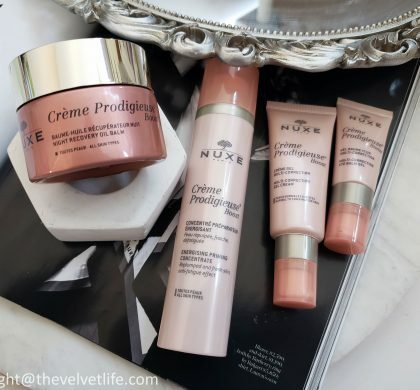 I follow with my night moisturizer for the night routine and I do have an SPF in my day routine. It works nicely under the makeup also. X50 Myocept is an exclusive, targeted delivery system of two neuro-peptides that directs actives specifically to the skin cells that help to relax lines and wrinkles. Argireline – Acetyl hexapeptide-3 is a widely used synthetic neuro-peptide anti-wrinkle cosmetics ingredient.This peptide targets the same molecular pathway as Botox TMresulting in gentle wrinkle relaxing effects. Proprietary Whey Protein stimulates skin cells to produce NEW collagen and has moisture-retaining properties. Niacinamide –Form of Vitamin B3.Potent cell-communicating ingredient that can improve skin’s elasticity, dramatically enhance its barrier function, help reduce discoloration, and revive skin’s healthy tone and texture. 97% Pure Glabridin is a powerful anti-inflammatory and skin lightening ingredient found in Licorice Root Extract. We are able to make this purity via a specialty engineering process developed by our Skyler Affiliate supplier. Magnolia, Boswellia and White Birch –Erasa contains a proprietary combination of scientifically proven, natural anti-inflammatory extracts specifically formulated to block skin inflammation. Creatine –Creatinine provides energy to cells, promoting the health and metabolism of cells which in turn assists in building more collagen. 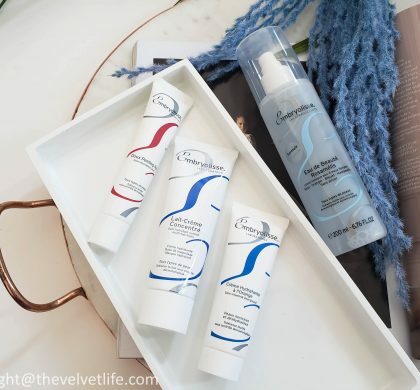 Proprietary polymers & microspheres – Erasa helps skin look fabulous immediately by featuring polymers and microspheres that even skin tone and reduce the appearance of wrinkles. 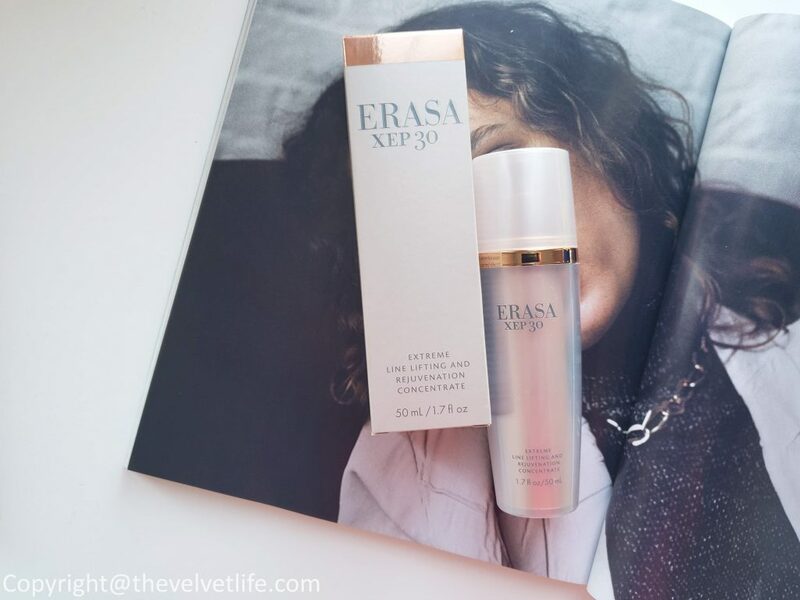 Erasa’s exclusive, patented technology with the line reducing the power of non-invasive XEP 30 neuropeptide is combined with 3 other powerful neuropeptides to create the ultimate peptide complex. XEP 30 is a biomimetic molecule that mimics the peptide found in cone snail venom. This complex works gently beneath the skins’ surface day by day, helping to relax forehead and facial areas, smoothing lines and wrinkles. There are some more interesting information and results of clinical tests on the official website here.